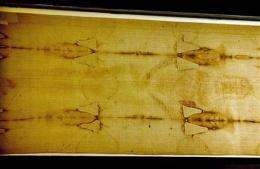 (AP) -- Scientists have reproduced the Shroud of Turin - revered as the cloth that covered Jesus in the tomb - and say the experiment proves the relic was man-made, a group of Italian debunkers claimed Monday. The shroud bears the figure of a crucified man, complete with blood seeping out of nailed hands and feet, and believers say Christ's image was recorded on the linen fibers at the time of his resurrection. But the dispute continued because experts couldn't explain how the faint brown discoloration was produced, imprinting on the cloth a negative image centuries before the invention of photography. The research was funded by the debunking group and by an Italian organization of atheists and agnostics, he said. The shroud is first recorded in history around 1360 in the hands of a French knight - a late appearance that is one of the reasons why some scientists are skeptical of its authenticity. Measuring 13 feet (4 meters) long and three feet (one meter) wide, it has suffered severe damage during the centuries, including from fires. Owned by the Vatican, it is kept locked in a special protective chamber in Turin's cathedral and is rarely shown. The last public display was in 2000, when more than 1 million people turned up to see it, and the next is scheduled for 2010.